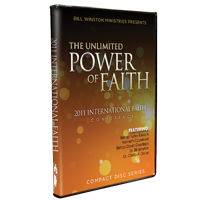 Listen to the life-changing messages of the 2011 International Faith Conference as often as you want by ordering the conference series on CD or DVD. Featured speakers include: Dr. Bill Winston, Bishop Tudor Bismark, Kenneth Copeland, Bishop David Oyedepo and Dr. Creflo A. Dollar. Don’t let your faith become stagnant, dig into the power of God’s Word and take hold of His promises for your life by unleashing The Unlimited Power of Faith!